The South Korean Smart phone manufacturer, Samsung, has announced the Galaxy S5 in Barcelona with many new features like the Finger scanner, Heart rate sensor and many more, now it’s time to find out how it stacks up with its predecessor Samsung Galaxy S4 and the Galaxy Note 3 that has been one of our favorite device in terms of the design and performance. The Samsung Galaxy S5 is a litter bigger than the Samsung Galaxy S4 and we all know that the Galaxy Note 3 is a big Phablet with bigger size and dimensions, the newer Galaxy S5 has the dimensions 142 x 72.5 x 8.1 and weights 145 grams where as its predecessor weights 130 grams and the dimensions of it are 136.6 x 69.8 x 7.9 mm. The Galaxy Note 3 weights 168 grams and has the dimensions of 151.2 x 79.2 x 8.3 mm. The back panel on the Galaxy S5 is still plastic with a metallic perforated effect giving a better grip but we expected the famous faux leather back that we have seen with the Note 3, but the back is still good enough for me, but leather back would have satisfied us more. The new flagship from Samsung, the Samsung Galaxy S5 has a 5.1 inch Super AMOLED panel sporting the same 1920 x 1080 pixel full HD resolution as its predecessor S4 and Note 3 also, but the screen size and resolution of these devices vary with the Samsung Galaxy S4 having a 5 inch screen with 441 ppi and the Note 3 featuring a 5.7 inch screen with 386 ppi. The difference is the ppi is due to the same resolution seen on the different screen sizes. The flagship has a Qualcomm Snapdragon 801 quad core chipset clocking at 2.5 MHz accompanied by Adreno 330 GPU and 2 GB of RAM, where as you will see a Qualcomm Snapdragon 600 Quad core, 1.9 MHz chipset along with Adreno 320 GPU and has the same RAM as seen in its successor at 2 GB. The Samsung Galaxy Note 3 has a Qualcomm Snapdragon 800 Quad core chipset clocking at 2.3 MHz and coupled with Adreno 330 GPU and 3 GB RAM. More over all the devices in the list run on the latest Android KitKat with all new goodies. The battery on the devices is at 2800 mAh, 2600 mAh and 3200 mAh respectively. With all the new features like Finger scanner, Heart rate sensor, HDR , Hybrid Autofocus and many more features and also with the IP67 certification that makes it Dust and Water proof is always a improvement over the other two devices in the list. Samsung has stepped up with a 16 MP camera on its latest flagship, which is a major improvement over the 13 MP camera found on both the Samsung Galaxy S4 and Samsung Galaxy Note 3. The Samsung Galaxy S5 is also capable of recording 4K videos along with the Note 3. The front facing camera on the Galaxy S4 and Galaxy Note 3 are at 2 MP and the Galaxy S5 has a tad better camera with 2.1 MP. The on board memory on the Samsung Galaxy S5 and Samsung Galaxy S4 are at 16 GB that can be extended further via micro SD card slot, where as the Note has an internal memory of 32 GB and even it can be extended with a micro SD card. 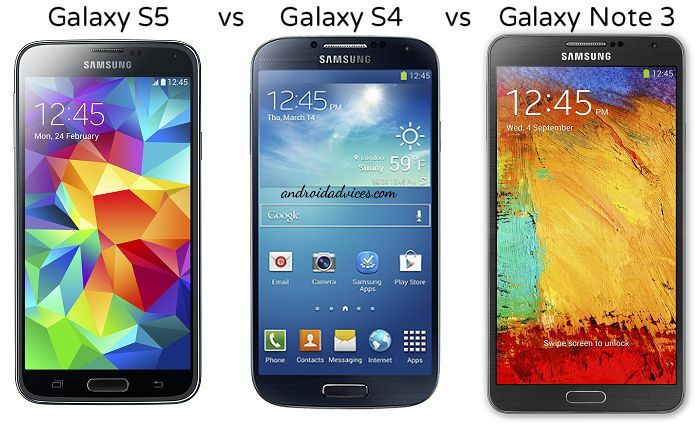 A final word could be given once Samsung comes up with the official pricing for the Galaxy S5. The S4 now is not the latest, and we do feel that the S5 has got some excellent upgrades, but the Galaxy Note 3 is in a different league, and although the S5 has got the S Note and similar apps, the S Pen will be very much missed if someone wants to take advantage of the S Note app. Still, the 16-megapixel camera is an excellent upgrade with the 4k video recording (although one variant of the Note 3 had the 4k recording). Let us see how Samsung sets the price for the S5.